If you have missing or heavily damaged teeth that need to be replaced, dental implants are the right solution for you. Dental implants are a secure and a lifelong solution to missing teeth. A surgical grade titanium implant screw is used to replace the tooth root and is surgically placed in the jaw. The implant fuses with jaw bone and serves as an anchor for a crown or other prosthesis. 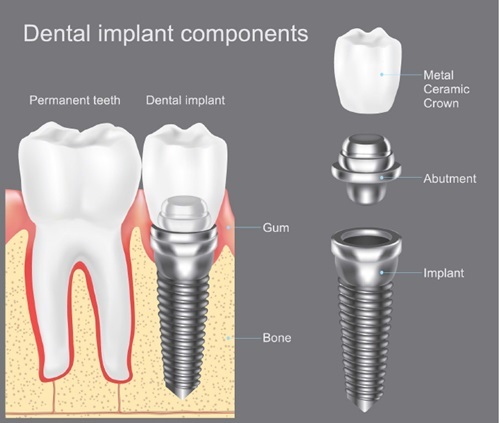 Then, an abutment is screwed into the implant and the prosthetic crown is attached either by a screw or dental cement to finish your permanent replacement tooth. An implant looks and functions like a natural tooth. Dental implants are also used as a strong foundation for implant-retained or implant-supported dentures and bridges.